Hopefully everyone got to watch and enjoy the official trailer for Robert Zemeckis' A Christmas Carol? If not, you can check it out here. Disney has debuted one final poster for the movie today over on Cinematical. I'm somewhat amused to see that Disney's entire marketing campaign seems to be focused around that one scene where Scrooge puts that giant candle dowser over one of the ghosts and goes flying through the air for about 20 minutes. It seems as if they're trying to sell this whole movie as a big cinematic gimmick, where it'll be an "experience" to see that scene in 3D in theaters! Bah humbug, I say! Anyway, check this out below. The official trailer for A Christmas Carol can be seen online right here, however it's not in 3D online. 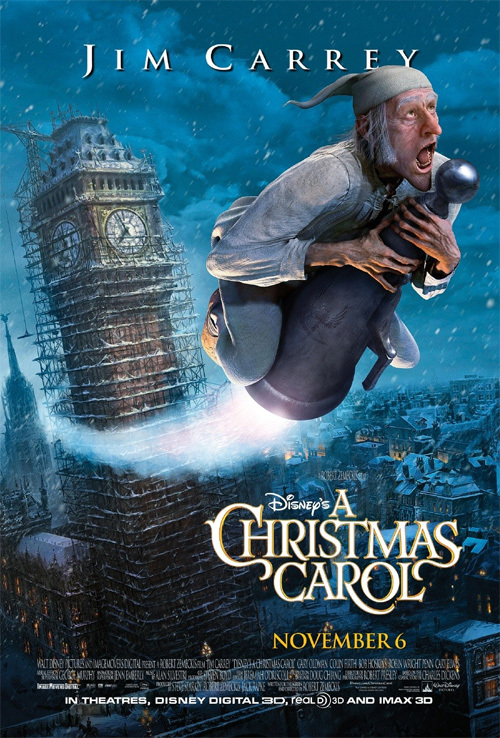 Christmas Carol = AVATAR CGI lol.... Im sure this movie will do well. Its a classic Christmas Story that will live on forever. saw the previews for this in 3D. promising...hoping the story/directing will hold up because we all know the visuals will. I wish Zemeckis would go back to doing live features. He has made some really great films. "Back To The Future" "Forrest Gump" "Contact" and "Cast Away" are fantastic. Zemeckis Leave the animation to those guys at Pixar. The animation in this looks bad as was the animation in "The Polar Express" & "Beowulf". I find this poster extremely phallic.